Researchers have discovered that thawing permafrost in the Northern Hemisphere stores twice as much mercury as the rest of the planet’s soils, atmosphere, and oceans. The finding has significant implications for human health and ecosystems worldwide. In a new study, scientists measured mercury concentrations in cores of frozen ground—or permafrost—from Alaska and used the data to estimate how much mercury has been trapped in Northern Hemisphere permafrost since the last Ice Age. They found that Northern Hemisphere permafrost regions contain 1,656 gigagrams of mercury (32 million gallons, or enough to fill 50 Olympic-sized swimming pools), making them the largest known reservoir of mercury on the planet. This amount is nearly twice as much mercury as all soils outside of the northern permafrost region, the ocean, and the atmosphere combined. The researchers also found that of the 1,656 gigagrams of mercury, 863 gigagrams lie in the surface layer of soil that freezes and thaws each year (27 Olympic-sized swimming pools), and 793 gigagrams are frozen in permafrost (23 Olympic-sized swimming pools). “This implies permafrost regions contain roughly 10 times the total human mercury emissions over the last 30 years,” said NSIDC scientist Kevin Schaefer, a co-author of the study published today in Geophysical Research Letters, a journal of the American Geophysical Union. Permafrost is permanently frozen ground and occurs in approximately 22.79 million square kilometers, or about 24 percent of the Northern Hemisphere land surface surrounding the Arctic ocean. Mercury naturally occurs in the Earth’s crust and typically enters the atmosphere through volcanic eruptions. 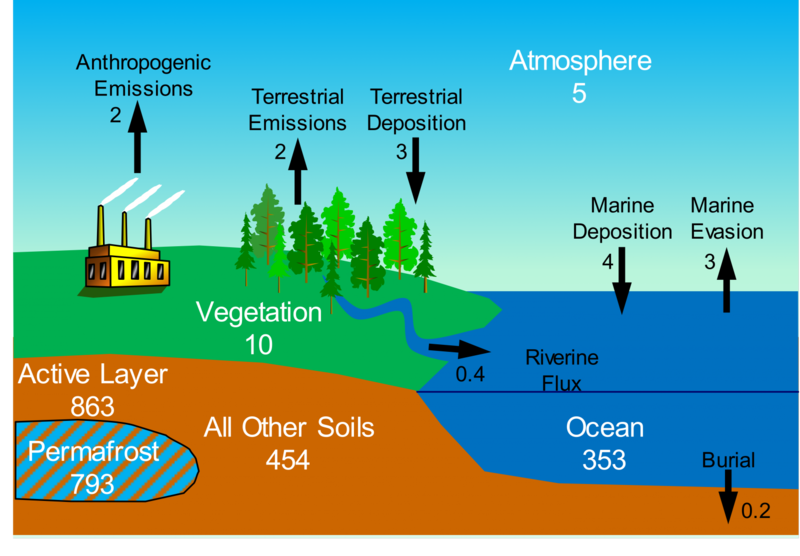 The element cycles between the atmosphere and ocean quickly. However, mercury deposited on land from the atmosphere binds with organic matter in plants. After the plants die, soil microbes eat the dead organic matter, releasing the mercury back into the atmosphere or water. In permafrost regions, however, the organic matter gets buried by sediment before it decays and becomes frozen into permafrost. Once frozen, the decay of organic matter stops, and the mercury remains trapped for thousands of years unless liberated by permafrost thaw. “As long as the permafrost remains frozen, the mercury will stay trapped in the soil,” Schaefer said. Higher air temperatures due to climate change could thaw much of the existing permafrost, allowing the decay of organic matter to resume and releasing mercury that could affect Earth’s ecosystems. The released mercury can accumulate in aquatic and terrestrial food chains and cause harmful neurological and reproductive effects on animals. “Although measurement of the rate of permafrost thaw was not part of this study, the thawing permafrost provides a potential for mercury to be released—that’s just physics.” Schuster said. Climate models predict a 30 to 90 percent reduction in permafrost by 2100, depending on actual fuel emissions. The researchers determined the total amount of mercury locked up in permafrost using field measurements. 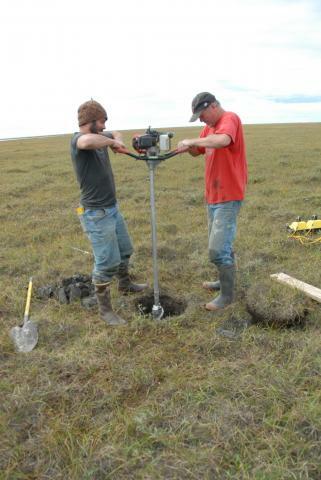 Between 2004 and 2012, the study authors drilled 13 permafrost soil cores at various sites in Alaska and measured the total amounts of mercury and carbon in each core. They selected sites with a diverse array of soil characteristics to best represent permafrost found around the entire Northern Hemisphere. Schuster, Schaefer, and their colleagues found their measurements were consistent with published data on mercury in non-permafrost and permafrost soils from thousands of other sites worldwide. 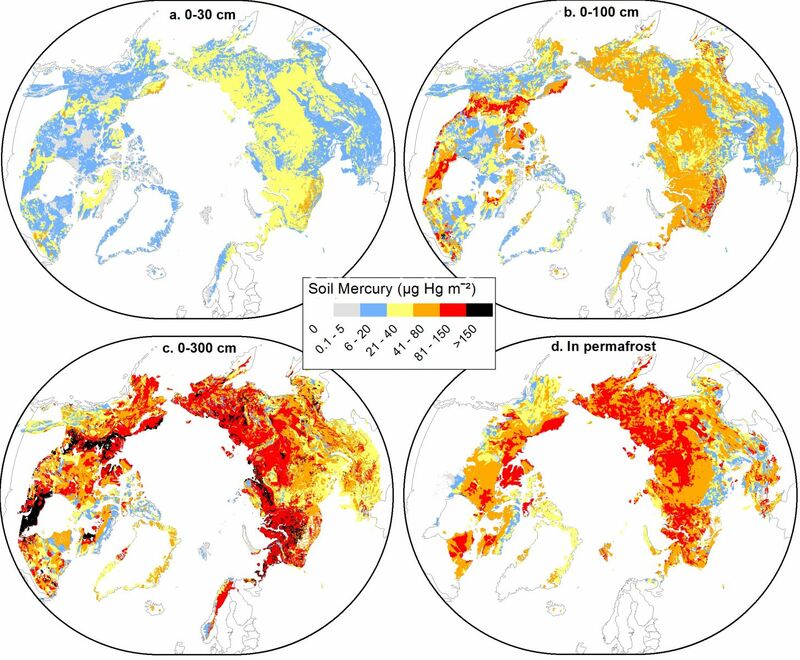 They used their observed values to calculate the total amount of mercury stored in permafrost in the Northern Hemisphere and to create a map of soil mercury concentrations in the region. 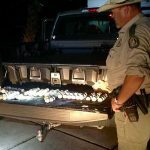 The researchers believe their study gives policymakers and scientists new numbers to work with and calibrate their models as they begin to study this new phenomenon in more detail. The researchers intend to release another study modeling the release of mercury from permafrost due to climate change. Schuster, P. F., Schaefer, K. M., Aiken, G. R., Antweiler, R. C., Dewild, J. F., Gryziec, J. D., …Zhang, T. (2018). Permafrost stores a globally significant amount of mercury. 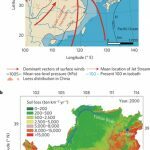 Geophysical Research Letters, 45. https://doi.org/ 10.1002/2017GL075571. 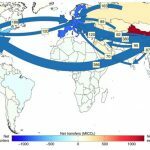 This research article is available for free for 30 days at http://onlinelibrary.wiley.com/doi/10.1002/2017GL075571/pdf.